Jan 22, 2019 | What Am I Reading? 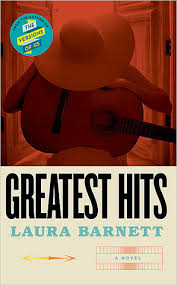 Greatest Hits (Orion Books 2017) by UK author Laura Barnett is a densely-packed and intricately detailed account of the life of (fictional) British singer-songwriter Cass Wheeler, famous and hugely popular since the 1970’s, but absent from public life for the last 10 years. Cass has set herself a task – over the course of a single day – to put together a list of 16 of her songs (from the many hundreds she has written and performed) to depict the narrative of her life through a unique compilation. The book is structured over the course of that single day, woven through with complex memories and flashbacks of her life over almost 70 years, and punctuated by the lyrics from the 16 songs she has chosen. From the first pages, we know that a tragedy occurred 10 years earlier which caused Cass to disappear from public life. At the start of the novel, this is only hinted at, but as the day progresses, and Cass immerses herself in memories as she revisits the songs she wrote – and the life events that inspired them – the awful truth of the trauma that almost destroyed her begins to come into focus. This is a very intense, almost microscopic, examination of a life, beginning with Cass’s earliest childhood memories. Born in 1950 to a father who was a Reverend, and a mother who fled the pair of them to embark on a new life elsewhere, Cass grows up living with this sense of abandonment, and guilt that she wasn’t enough to make her mother stay. Through a matrix of people that make up her life – friends, lovers, family and professional associates – we are presented with a portrait of a woman that includes the ups and downs, the successes and failures, the separations and discoveries, the romance and the friendships, the loyalties and betrayal, the mistakes and the many choices she has made along the way. Although I found this novel a little slow to start, or perhaps a little difficult to fully engage with, as the years pass and Cass’s life unspools like a roll of film, all of the characters that surround her come to life, and by the end, I felt I knew Cass as intimately as if I had just read a non-fiction biography of a real person. The last section, which reveals the details of the tragedy that caused her breakdown and her retreat in isolation for a decade, is moving and compelling. But it is the unique structure of this novel that sets it apart. The lyrics of Cass’s 16 chosen songs are included, interspersed throughout the book, and the really interesting thing is that the author wrote these herself, and then later collaborated with a real singer / songwriter who put music to the lyrics, resulting in a joint release of the book and the music. You can see the result on YouTube. This book will appeal to those readers who love to immerse themselves fully in the minutiae of a life, and particularly to those music fans who enjoy insider access to the interior lives of musicians, especially those throughout the 1970’s. Cass Wheeler: singer, lover, daughter, mother, friend, wife, songwriter – this book is a tribute to what makes a life, how to live with our mistakes, and how to ultimately derive pleasure and satisfaction from the cards we are dealt.